Every day millions of people driving around Chicagoland listen to the local traffic reports on TV or the radio. 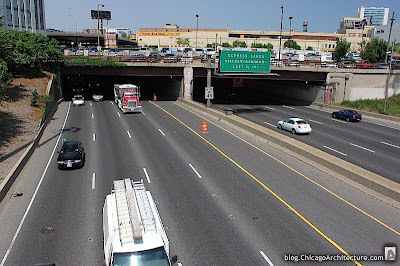 Hundreds of times a day, traffic reporters reference a place in Chicago called “Hubbard’s Cave.” Travel times in and out of the Loop are calculated based on the location of this landmark. But remarkably few people really know what it is, or what it looks like. 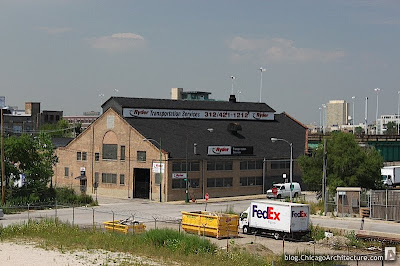 Many people are correct when they state that Hubbard’s Cave is the place where interstates 90 and 94 go under Hubbard Street in West Town. But there’s a lot more to Hubbard’s Cave than a simple overpass. Hubbard’s cave runs for a quarter of a mile from West Hubbard Street to West Wayman Street. Unless you’re stuck in traffic, in a car it flashes by in the blink of an eye since there are so many other things to keep your eyes on at that critical salmon run in the highway. But up top, there’s quite a lot to see. 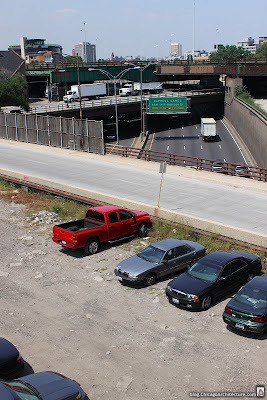 More than just a street underpass, Hubbard’s Cave is a triple-decker infrastructure sandwich that passes beneath railroad tracks, parking lots, even entire warehouses are perched over this most vital of Chicago’s motor arteries. 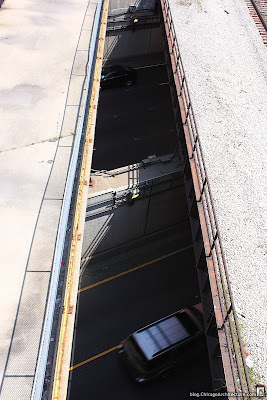 Now and then there are gaps in the roof allowing people to peek down into traffic. Or more often — allowing the traffic below brief glimpses into shafts of sunlight from above. The earliest reference to “Hubbard’s Cave” we could find in local newspapers was from 1962, and it’s clear from the context that the name was already in common use by the public. Back then what we now call the Kennedy Expressway was known as the Northwest Expressway and people traveling the route were in much more peril than today’s travelers. That’s because of the “cave,” itself. It earned its name because its size made it unusually dark for an underpass segment of a freeway. So drivers entering the underpass needed a few seconds for their eyes to get used to the darkness. Then, less than a minute later, they’d be blinded by the sun as they emerged from the other end. The name, obviously, comes from Hubbard Street above. But there is some evidence to show that it may be WGN Radio’s Irv Hayden who coined the term and made it famous. He was 720’s helicopter traffic reporter, best known for occasionally landing next to freeways and helping stranded motorists push their cards to the shoulder. It was his use of the term that spurred city officials to do something about the “cave”-like nature of the road. It’s remarkable by modern standards to realize that this underpass, and perhaps many more like it, were unlit. There were no lights underneath the bridges and viaducts that make up the cave. It was originally thought that car headlights would be enough to successfully navigate the passage. That changed in 1962 when the city of Chicago spent $160,000 to fix the day-night-day problem for drivers. According to a letter to the editor in the August 26, 1964 edition of the Chicago Tribune, the city spent $20,000 covering the walls with high-gloss paint to reflect light, and another $140,000 on lights so that drivers’ eyes wouldn’t have to make such painful adjustments from light to dark and back to light again. Edward Reiter, the man who spearheaded this project when he was chief engineer of the City of Chicago’s Division of Subways and Superhighways (what a great department name! ), lobbied to have the name of the underpass changed to “Reiter’s Daylight Passage” since it was he who turned the “cave” into something else. But, as we all know, nearly 50 years later the name remains the same. Great post, and I love the pictures. My dad commuted from Park Forest and environs into the city for about 30 years–mid-50s through mid '80s–though he didn't ordinarily have to use the Cave. But he listened to WGN's traffic reports, and he really got a chuckle out of the name. And of course, he'd say "Hubbard's Cave!" every time we drove through it. Actually, Wayman falls within the Near West Side Community Area. Hubbard, on the other hand, IS in West Town. In terms of neighborhoods, Wayman runs through both the Fulton River District and West Town. Hubbard runs through Near North Side, River North, Fulton River District, West Town, South Austin, and beyond. There’s even a Hubbard Park way out by Cicero Avenue. For Community Areas, you are correct — Wayman runs through Near West Side. 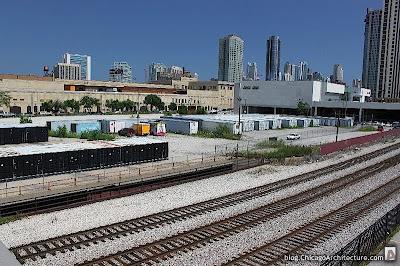 However, Hubbard runs through West Town, and Austin (skipping Garfield Park and West Garfield Park) becuase the northern border of the Near West Side Community Area is Kinzie Street. 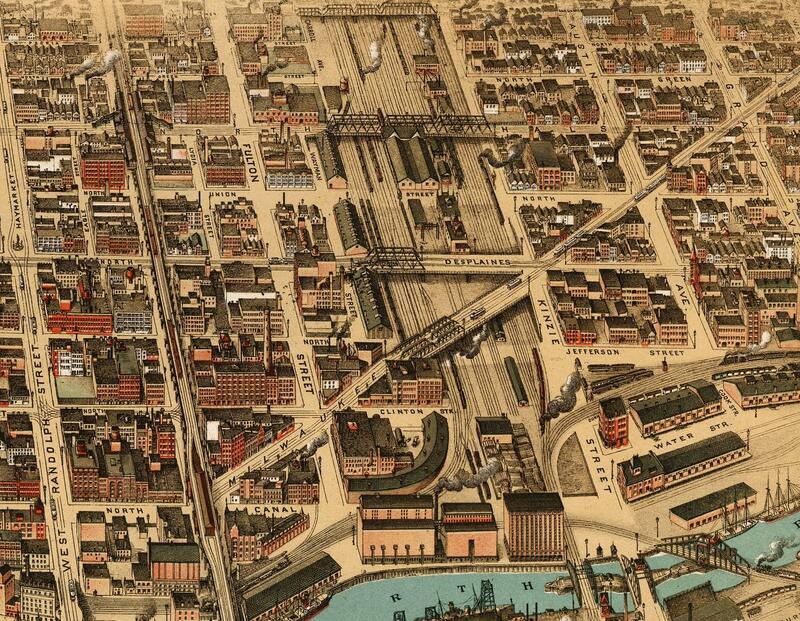 Hubbard’s cave was originally built as a tunnel underneath the railroad yard between Fulton & Kinzie streets. Since then most of the railroads have been removed, but the tunnel remained. Thanks for this. Great info on the cave! 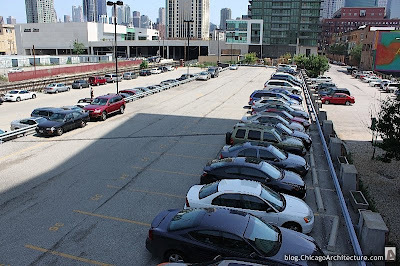 I am an old geezer, and I remember the actual reason why it was called “Hubbard’s Cave.” It is true that the highway goes under Hubbard Street, and that the WGN radio traffic reporter called it “Hubbard’s Cave,” but he was referring to EDDIE HUBBARD, the morning man on WGN radio at that time. In October, 1969, I was 19 years old and was visiting Chicago from Richmond Virginia. It was late at night, and traffic was travelling at nearly 70 mph. I was in the right hand lane. Just before I entered Hubbard’s cave, I decided to switch lanes and got over to the left one lane. You could not see into the cave because the lighting was terrible. I remember going through the portal and having to adjust to the crappy lighting. Just as I did that, I could hear a series of loud slams. Cars in the right hand lane were slamming into each other at highway speeds because of the crappy lighting. Had I not switched lanes, two seconds later I would probably have been dead. To this day, I curse whomever was responsible for that horrible piece of engineering and all their descendants. I can only imagine how many people have been maimed or killed because of that lousy engineering.